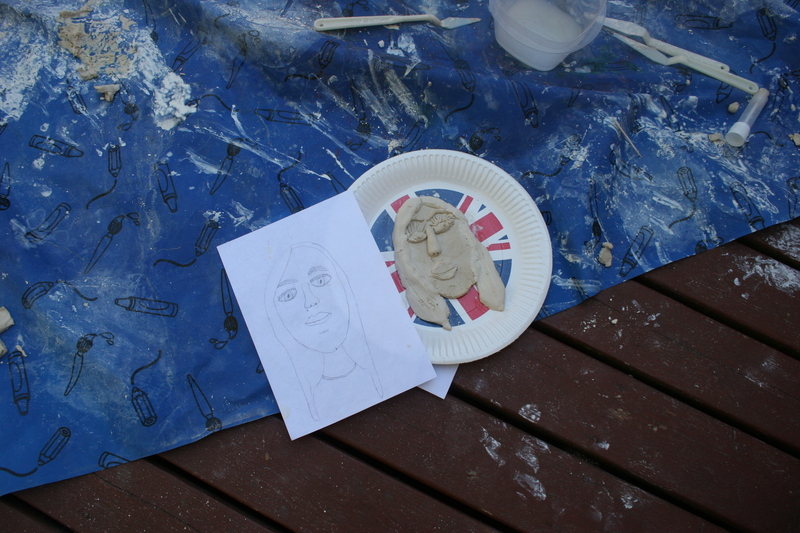 In my previous post about using clay with young children , I mentioned a project where the children had closely observed their faces, drawn self portraits and then created clay models from the portraits. It was a really successful project at nursery and the level of detail in both the drawings and models was astonishing. Children love to look at themselves in the mirror, exploring expressions and actions. I thought my children would enjoy examining their faces in this way. The girls like to make a present for their dad on his birthday and as this was a special birthday, I wanted to them to make something that he could keep. When I suggested the self portraits to the girls, they thought it was a great idea. I gave the girls small hand mirrors and we looked at our faces in them. We talked about the shape of their face, the shapes of their features, we looked closely at any marks or scars they may have and then they began to draw. What shape are your glasses? Does any of your hair go on your face? Can you see your ears? What shape is your chin? Can you see any scars or freckles ? Would you like to draw your teeth or have a closed mouth? I would recommend doing this activity on a 1-1 basis to help the children to make the drawings detailed. My 9-year-old became really frustrated. She felt that the drawing didn’t look like her and worried about the shape of her eyes, nose and mouth. I suggested she take a break and come back to it later. My 4-year-old had no such anxieties. It is interesting that in the development of children’s drawing anxiety about realism in drawing occurs from the age of 8, and this dissatisfaction increases as they get older. I assume this is why most adults believe they can’t draw. The most difficult part was their long hair because it kept breaking. When the models were dried, I asked the girls if they would like to paint their models or leave them as they were. They really wanted to paint them. I helped them to mix skin tones, hair and eye colours. I’d love to find a way of displaying them alongside the portraits. Making the faces on a tile might make this easier. The girls love exploring expressions. We have a series of photos of the girls copying their dad’s expressions. We could extend this into a photography project about expressions. Read the book ‘Making Faces’ by Nick Butterworth and explore some of their favourite expressions from the book. Draw portraits of their own or one another’s faces making different expressions. Translate these into clay models.